Paul found this old flyer on-line - god knows how! 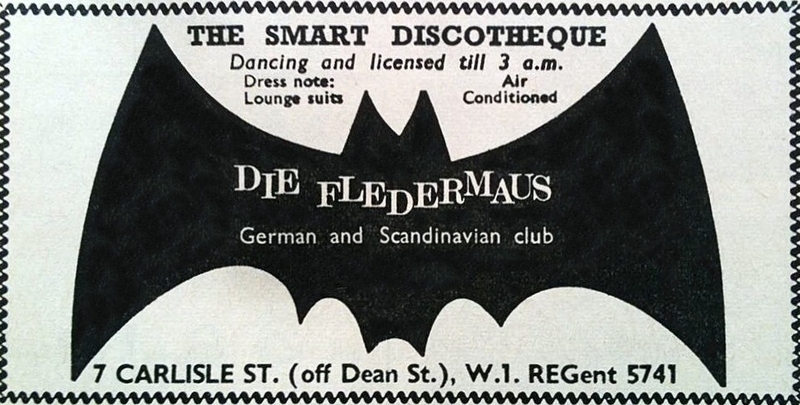 The venue came to be known as a discotheque, the fancy French name stemming from London's first such establishment– La Poubelle which opened on Great Marlborough Street near Oxford Circus in 1959. 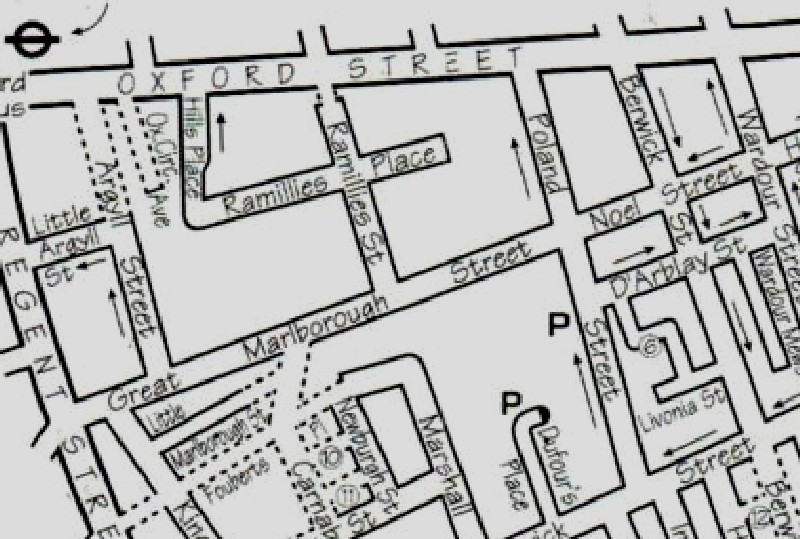 Jeff Dexter informed us that the first address of La Poubelle was 52 Great Marlborough Street, although there was a way in from the Poland Street Garage through the service road. Adrian Well this page has been missing since the last major update and no-one told me! Now it's here. Hope you have some more stuff for me! And Lise-Lott can you put any more names to your pictures? Then it was at 7 Carlisle Street. Vibeke / Vibi Die Fledermaus opened early 1965. I was the first DJ there. In the bar was Christel from Vienna and another Danish girl, Lis. Burt / Bert was the manager there as far as I remember. Started working in Le Kilt later 1965. John Kirkman Thanks for the reply Adrian. I am regrettably unable to remember the exact year after wracking my brain but it could have been close to the opening years 66/67. Anyway, thanks for taking time out to take me back down memory lane. We opened the club in 1968 - closed? Well when did it become the Experience? Anyone remember? 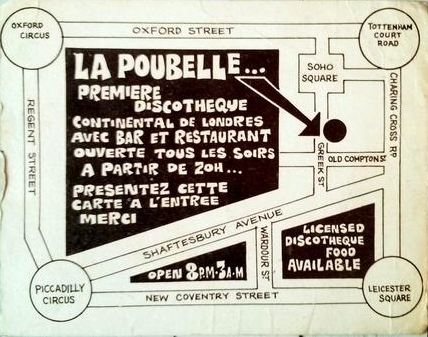 Jon F Jean -Pierre ( Belgian) former manager of Samantha's managed the Poubelle circa 1968 before moving in to manage Countdown (Newman St) in approx: 1970/1. 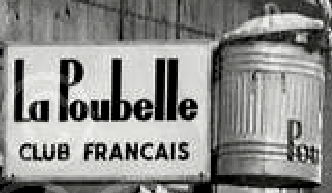 Steve Knight Think Jean-Pierre was manager of La Poubelle in at least 1967 - I left Le Kilt in March 1968 and I'm sure that he was at La Poubelle the year before, possibly earlier. Steve Knight The La Poubelle I remember wasn't in Greek Street but block or so away and that must have been Carlisle Street but my memory is faulty these days and can't place the year but definitely before 1968. Maybe 1965 or 1966? Jean Dore I worked with Paul as the Asst Manager at La Poubelle from the beginning before skipping out of London in 1969, I also worked with Stephen Less at La Valbonne when it opened. Adrian I know my memory too is faulty - but which Paul? 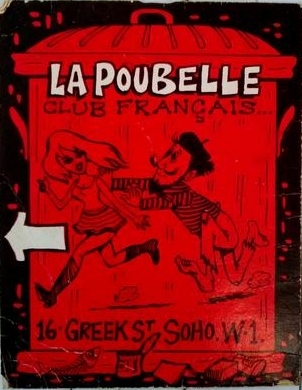 TESTE JEAN-CLAUDE COUNTDOWN DISCO,78 WELLS STREET LONDON W1. REGARDS. Jon F Thanks I was never sure if it was Wells St or Newman St. Alas the old 78 Wells St. is no more. A new office development stands in its place. We used to go to Countdown after Peguy closed at 11 pm, Peguy was a place to meet, Countdown was a club to drink, dance and smooch.